Plans for a new brain injury rehabilitation hub and housing centre in Ipswich have been boosted thanks to some large donations towards the cost of the build. 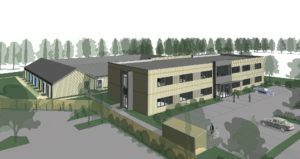 Brain injury charity Headway Suffolk is embarking on exciting plans to build the centre, which will include 24 homes in two bungalows for local people with acquired brain injuries and neurological conditions, on the Ravenswood area of Ipswich by 2020. The centre, which will be named the Professor Stephen Hawking Centre, after the famous scientist, has won the backing of Ipswich MP Sandy Martin and Suffolk county councillor for the Ravenswood area Bill Quinton. Headway Suffolk has received anonymous donations of £10,000 and £5,000, as well as two donations of £1,000 from carers, towards the £5 million total cost. Anyone can get involved in sponsoring the new centre, including families, schools and businesses, by purchasing bricks from just 50p each. Companies can have a room named after them for a donation of £66,000. For those wishing to make an anonymous donation of £5,000 or more, can do so through Suffolk Community Foundation at: www.suffolkcf.org.uk. Headway Suffolk chief executive Helen Fairweather said: “We are very grateful for all the donations that we have received so far, no matter how large or small. It really is appreciated. If you wish to discuss further how you can get involved, contact Helen Fairweather, Chief Executive, on 01473 712225 or email: helenfairweather@headwaysuffolk.org.uk. For more information on the housing plans, visit our housing page.